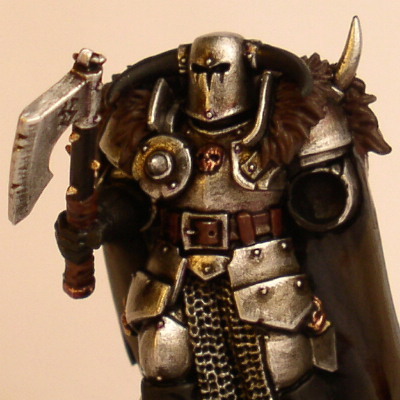 This tutorial is only part of a guide covering the painting process of a Chaos Warrior: Tutorial intro. For a more detailed description on my approach to painting metal go here. 2. The armour is washed/glazed using a mix of Tamiya Clear Orange, Chaos Black, a little Chestnut ink. The wash is thinned with water and a drop of dish soap is added to make the wash flow easier and the coverage should be something between a wash and a glaze (hard to describe really). 3. 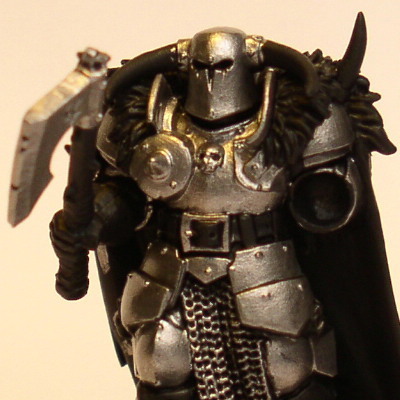 The armour is highlighted with thinned down Mithril silver. Thinning the paint makes it possible to "feather" or blend the highlights. See the remaining stages of the tutorial.